I know that a massive proportion of our readers are into organic gardening, so I thought it was about time to collate a book of organic gardening related pest repellent, organic fertilizer & composting recipes to share with our readers. The book will be available for immediate download once it’s organized, compiled and edited - hopefully within the next 2-3 weeks (depending on how many quality contributions are sent in and other time constraints). And at this stage, I’m unsure whether the book will be available for a small fee, or given away freely - however if YOU do send us in your recipes and help contribute to the collection, I’ll send you a free copy regardless. 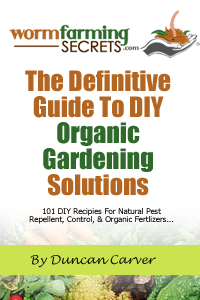 Ultimately what we’re going to create here is the definitive guide to DIY organic gardening solutions. A reference you can refer to again and again, whenever you need an organic solution for a problem in your garden. Please be as detailed as possible. Consider providing a brief introduction, a full ingredient (and tool) list, and a detailed explanation of what the recipe is useful for and how it should be used. If you can include any appropriate photos to help highlight your recipe, that would be excellent.